So after Deepholm we found Harrison Jones in the Stormwind Library and started a trek to southern Kalimdor for a high stakes adventure in the spirit of Texas Telly and the Golden Triangle of Destiny. Blizzard has fallen in love with cut scenes as a way to dictate the narrative. This is cool up to a point. In all of the previous zones we’ve seen some cut scenes, but Uldum so far seems to have quite a lot of them. To the point that it seems to be over used. By the time you finish this zone you will have seen every major plot point of Raiders of the Lost Ark acted out in cut scene form. The cut scenes also game some game play issues. There is a collection quest where when you get the last pot or vase or whatever you immediately go to a cut scene that transports you back to the quest hub. This is fine if you are soloing, not so cool if you are working in a group. In this quest line being the mage muscle I told Zel to go grab the pots/vases whatever while I took care of the bad guys. She did and was immediately transported away. She didn’t turn in the quest at the end of the scene (so as not to be “out of phase” with me) and mounted up to get back in case I needed help and to keep us on exactly the same step. Being a few ahead of me when I collected my next one as she almost got back to me (enough for me to be still one shy of completion), she got put back into that exact same cut scene she had just been through. Again she raced out to help just in case and arrived at my location just in time for that cut scene a third time. So the cut scenes can have a negative impact on gameplay experience, and it also makes you feel more passive in your heroic journey. This brings me to one little gripe about the stories in Uldum and back in Vashj’ir. Uldum starts off with your caravan being taken prisoner necessitating an escape. Now I’ve been able to make portals to Stormwind since 42, and the plots of both zones involve NPCs saying that they are “trapped”, or “can’t escape”, “if only there was some way out of here”. I know they can’t have the story resolve or divert based on a mage making a portal for escape to Stormwind where a plea is made to that jackass Wrynn to mount a holy crusade or whatever. It feels like watching a Sci-Fi show where one week they use this totally clever way to defeat the enemy and the next week you wonder why they don’t just do that again, but the characters on the show are struck with the dumb. This is obviously a mage-specific gripe because no other class would be able to allow an army to retreat from Vashj’ir or help your caravan escape out of their prison with ease like a mage could. When I replay those zones on my warrior, lock or priest it will obviously feel more appropriate to be trapped in those zones. Ah the sacrifices we must make to be awesome. 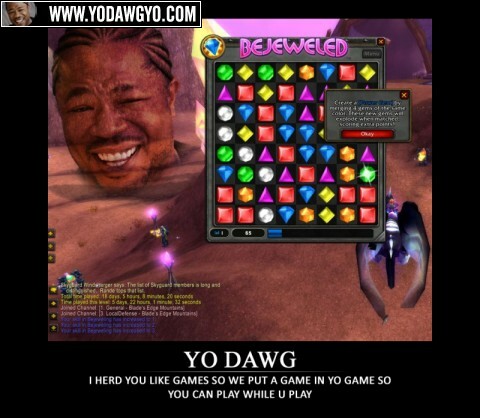 One final thing Blizzard seems to be loving is the Xzibit mentality of putting games in their game. In Hyjal we saw Joust, in Uldum there are two minor RTS type quests and a Katamari minigame. This makes me think that one of my predictions for Cataclysm months ago was spot on. Back in August I was leveling up my mining on the warrior, playing catchup on professions, and as I was looking for ore nodes in Silithus I thought “I think Cataclysm is the WoW remix album”. Basically they are taking us back to the old world, and they are redoing many of the stuff from classic WoW. And like all good remixes they bring in something from other popular works,and in this case it is these quests that are very much like other games. Overall Uldum was beautiful to look at, especially after the dreary Deepholm, but the cut scenes really took me out of the action. I know that overall Uldum is wildly popular among WoW players, but for me there was a bit too much homage to Indiana Jones, too many cut scenes, and I’m worried about the direction of the use of minigames that are other games in WoW. I play WoW to play WoW, not to play Plants vs Zombies, Angry Birds, or contract bridge. When they do that too much I worry that Blizzard is running out of ideas for this already mature game. On replay I might not do this zone again opting for Twilight Highlands instead. Not sure it’s that mage-specific. A lot of classes have some kind of teleportation ability (Shamans have Astral Recall, Druids have Teleport: Moonglade, DKs have Death Gate) although it’s true that you couldn’t get the whole army out. I read a similar dissonance from a druid player about Vashj’ir – all the business about being trapped in the boat and needing air and means of underwater transport seems a little silly when you can just transform into aquatic form. Eeps, how did I miss that one! I totally concur with your impressions of Uldum. Too many cutscenes, indeed. The minigames were okay, I guess, but not terribly challenging or engaging. While I do enjoy that Blizz has taken to popping cutscenes into gameplay here and there, I agree with you that the cutscenes in Uldum were overdone to the point of being annoying. All the novelty of cutscenes was worn out in a single zone…hell in a single quest chain. I don’t enjoy the cut scenes. Did you know you can simply press Escape to skip a cut scene? Now the only thing you need to complain about is how much they spent to develop all those scenes. I also rarely follow the quest story lines. I find most WoW related stories (including fan fiction) to be poorly written and poorly thought out. The simple solution is to not read it. Follow the instructions to finish the quests, then use the time saved to go read a quality book or watch a movie. This post sounded a lot like the shenanigans of the unknown guildee who disliked you for unknown reasons. I normally enjoy following your blog, but less drama, more info, please! The first time I pressed escape to end a cut scene, it messed up the teleportation, and I ended up being nommed by elites and summarily killed. doesn’t work for me. It used to work for the wrathgate cut scene, but must now have become bound to some other function. Anyone know where/how I can rebind it? I’m on my 4th toon thru Uldum and getting really bored of the cut scenes…. I also can’t from the Throne of Tides cut scene…which is bad when healing and the group goes on to the next pull and I’m stuck watching the cut scene. I suppose you can restore to default keybindings, but then you’d be stuck redoing your personal keybindings.